Q: Reports say that the tsunami that occurred on the evening of December 22 at the Sunda Strait in the west of Indonesia, has killed at least 281 people and injured 1,016 others. Has China sent messages of condolences or provided assistance to the Indonesian side? A: Indonesia is a friendly neighbor of China. China has been closely following the tsunami at the Sunda Strait which has caused heavy casualties and losses of properties. President Xi Jinping has sent messages of condolences to President Joko Widodo to convey deep condolences to the bereaved families and express sincere sympathy to the injured and people in the disaster-stricken areas. We are convinced that under the leadership of the Indonesian government, the people in the disaster-affected areas will rise above the difficulties and rebuild their homeland at an early date. The Chinese side will provide assistance to Indonesia's disaster relief efforts as its capacity allows through the Red Cross and other channels. Q: Canada's Foreign Minister said over the weekend that Canada will press its allies to keep talking out about the case of the two Canadians detained by China. 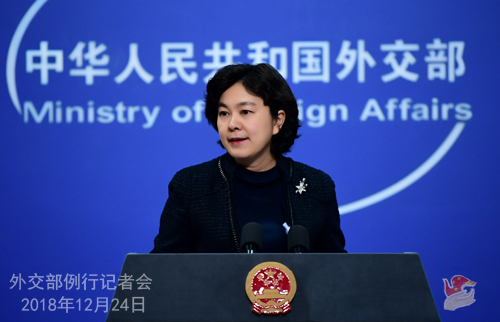 The Canadian Foreign Minister also said that she had discussed the conditions under which the Canadians have been detained with the Chinese side. Also last week, both Britain and the EU expressed concerns about the detention of the Canadians. What is your reaction? A: The Chinese side is strongly dissatisfied with and firmly opposed to the relevant remarks made by these individual countries including Canada and the US. 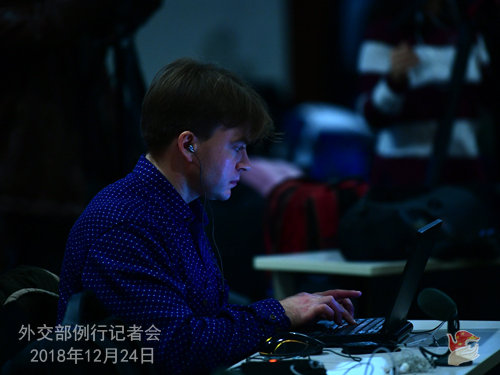 China's competent authorities took compulsory measures in accordance with the law against the Canadian citizens Michael Kovrig and Michael Spavor because they engaged in activities undermining China's national security. The relevant departments in China have ensured their legitimate rights and interests in accordance with the law and offered necessary assistance to the Canadian side to fulfill their consular duties. We urge the relevant countries to earnestly respect China's judicial sovereignty. As for the UK and the EU expressing concern over the detention of the Canadian citizens, I wonder how they are involved in this case? Where were their voices when the senior manager of the Chinese company was illegally detained by the Canadian side at the behest of the US side? It is quite obvious that the human rights they are talking about have different standards when it comes to citizens of different countries. I also want to ask the Canadian side something. At the behest of the US side, it illegally detained the senior manager of the Chinese company who has violated no Canadian laws as the Canadian side itself has acknowledged. This action, which is far from legal, legitimate and reasonable, is what truly merits the name of arbitrary detention. The Canadian side cannot stop talking about its so-called legal obligations under its bilateral extradition treaty with the US. Does that mean that it can turn a blind eye to and trample on the basic norms of international law and international relations? Does that mean that it is okay for Canada to ignore its obligations in terms of protecting the legal rights and interests of Chinese nationals? We have all noticed that such moves by the Canadian and US sides have invoked severe criticism and strong opposition from people with a sense of justice in Canada, the US and other countries. The ugly nature and impacts of the Meng Wanzhou case cannot be clearer. Once again, we strongly urge the Canadian side to correct its mistakes, immediately release Ms. Meng Wanzhou, and ensure her legal and legitimate rights and interests. We also strongly urge the US side to immediately withdraw its arrest order for Ms. Meng Wanzhou. Q: The Daily Nation of Kenya recently reported that in a letter to the Kenya Ports Authority (KPA), the Office of the Auditor General of Kenya raised questions over its Mombasa-Nairobi Railway loan payment agreement with the Export-Import Bank of China which uses the Mombasa Port as a collateral, revealing that Kenya could lose the port if it defaults in the payment. In response to this, the Office of the Auditor General clarified the situation and dismissed the report on December 19. KPA Managing Director Daniel Manduku told the media that there is no risk of losing the port. In fact, they will pay this loan ahead of time. What is your comment? A: Regarding the issue you mentioned, we have checked with the relevant Chinese financial institution and found that the allegation that the Kenyan side used the Mombasa Port as a collateral in its Mombasa-Nairobi Railway payment agreement with the Chinese financial institution is not true. The report you just cited said that the Kenyan side also has made clarifications on it. At present, the China-Kenya cooperation on the Mombasa-Nairobi railway is progressing smoothly. When cooperating with African countries including Kenya, Chinese companies and financial institutions will always conduct joint and thorough scientific study on the feasibility of the projects and then proceed to determine the construction and funding plans and scales to guard against causing debt risks and fiscal burdens for Africa. Q: In response to a joint peace statement by the Myanmar National Democratic Alliance Army (MNDAA), Ta'ang National Liberation Army (TNLA) and Arakan Army (AA), the Office of the Commander-in-Chief of the Defense Services of Myanmar made a peace announcement on December 21 on an immediate suspension of all its military actions in Northern Myanmar until April 30, 2019, and it will negotiate for ceasefire with ethnic armed groups. This development has been warmly welcomed by all sectors in Myanmar. What is your comment? A: The relevant ethnic armed groups in northern Myanmar and the Myanmar military released peace statements successively on halting military actions and reaffirming their commitment to resolving issues through dialogue and negotiation. This marks an important positive step in the peace process in Myanmar. China welcomes and supports that. Peace is what all ethnic groups in Myanmar aspire for. An early realization of peace and reconciliation in Myanmar serves Myanmar's fundamental interests. Dialogue and consultation represent the only right way out of the current issue. China, as a friendly neighbor, sincerely hopes that all parties in Myanmar could seize the trend for peace, act on the current important opportunities, meet each other halfway, and actively engage in contacts and dialogues so that Myanmar could realize national reconciliation, peace and development at an early date. China has been playing a positive and constructive role in promoting dialogue and reconciliation among all Myanmar parties at their request. We will continue to work with Myanmar to jointly ensure peace and stability of the China-Myanmar border areas and act as a staunch supporter for Myanmar's peace process. Q: We noted that the ROK and the US held the DPRK-related working group meeting on December 21. Special Representative for Korean Peninsula Peace and Security Affairs of the ROK Ministry of Foreign Affairs Lee Do Hoon said that the ROK and the US believed that the period from now to the beginning of next year is the critical stage to establish a permanent peace regime on the Korean Peninsula and that they agreed to jointly promote the resumption of US-DPRK dialogue. The two sides agreed to waiver sanctions on such cross-border projects as railways and highways between the ROK and the DPRK. Stephen Biegun, the US Special Representative for the DPRK issue said that the US would not ease sanctions on the DPRK but it would still consider accumulating the mutual trust between the US and the DPRK. What is your comment? A: We have noted relevant reports. Since this year, there has been a big turnaround regarding the situation on the Korean Peninsula. Those hard-won progresses meet the shared aspirations of all relevant parties as well as the international community and should be cherished by all relevant parties. We have seen that the situation on the Korean Peninsula and the peace talks are at a crucial stage. The US and the DPRK are discussing the implementation of the consensus reached during their leaders' meeting. The DPRK and the ROK are also continuously promoting reconciliation and cooperation. We hope that the relevant parties can seize the opportunity, meet each other halfway, demonstrate goodwill to each other, advance the denuclearization of the Korean Peninsula and the establishment of a permanent peace regime on the Peninsula in a coordinated way, address each other's legitimate concerns, continuously enhance political mutual trust and move forward the political settlement process of the Korean Peninsula issue. Q: The US has failed at its push to cap its share of UN peacekeeping funding at 25%. What is your comment? A: On December 23, the Fifth Committee of the UN General Assembly reached consensus and adopted a resolution on the annual contribution and peacekeeping funding shares of UN members for the period 2019-2021. The resolution maintained the current share calculating methods and sent out the core message that the principle of capacity to pay and multilateralism must be upheld, which is also China's consistent position. We welcome and support the adoption of this resolution by the General Assembly. We hope that all parties could earnestly implement this resolution to ensure a stable and predictable fiscal foundation for the UN. Q: Papers released by WikiLeaks on December 21 showed that US embassies in many countries have been buying spying tools. For instance, in August, the US Embassy in El Salvador requested a list of items including 94 spying devices, such as night vision cameras that can be installed in cars and the cameras masqueraded as everyday objects, including pens, lighters, shirt buttons, and glasses. The US Embassy in Ukraine has stocked up on covert radios and voice recorders, among other items. The release also highlights that the US Consulate-General in Frankfurt is a covert base for US hacking operations across Europe. What is your comment? A: I believe many people after seeing this piece of news will have the same question as I do: why do they need so many spying tools? What are they going to do with them? For whom and for what purposes are these items meant? Just a few days ago, the US drew some of its allies together to accuse China of sabotaging US cyber-security over a long period of time. These papers released by WikiLeaks just proved that the US who is so good at a thief crying "stop thief" is putting on the show again. I believe the PRISM case is still fresh in our memory though five years have passed. According to the disclosed information at that time, the US carried out massive spying and espionage activities around the globe. Its own allies were also targeted. The US still owes the world an explanation to that. Now with the new information exposed by the WikiLeaks, the US also needs to clarify it. I also want to remind these allies of the US that on the issue of cyber-security, they should not forget what they have been through just because time has passed and the wounds may have healed. Q: The UN General Assembly just adopted a resolution on members' financial contributions and peacekeeping shares for the period 2019-2021. China will become the second-largest financial contributor to the UN's regular budget and peacekeeping operations. What is your comment? A: The core principle of the UN in determining its budget contributions is the capacity to pay. China's total economic volume is huge, but its per capita national income is low and it still belongs to the group of developing countries, which serves as the main basis to determine China's capacity to pay. In accordance with this resolution just adopted by the General Assembly, China's contributions to the UN's regular budget and peacekeeping operations will surge substantially in the next three years, shouldering 12% and 15.2% respectively. This is a result of the increase in China's economic aggregate and per capita national income in recent years as world's second largest economy and a reflection of China's growing international influence. China is firmly committed to upholding multilateralism and fulfilling its financial obligations to the UN as a developing country. While contributing to world peace and development, we will also resolutely safeguard our legitimate rights. Meanwhile, we urge all countries to pay their shares for regular budget and peacekeeping operations in time and in full to support the UN in playing a bigger role in maintaining world peace and promoting common development. Q: Has there been a date set for the deportation of Sarah McIver, who is charged of working illegally in China? A: The competent Chinese authority will deal with it in accordance with the law. 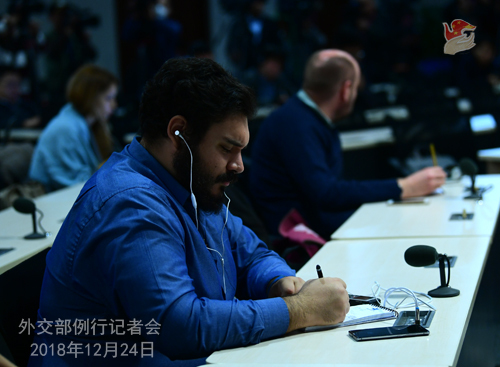 Q: Recently, some western media have been hyping up Xinjiang-related issues. Yesterday, the Wall Street Journal reported that over the past one year or so, Xinjiang stepped up its program of mass surveillance, detention and assimilation of Muslims and relevant practices are being replicated in other parts of China with Muslim communities. What is your comment? A: First of all, I want to point out that with regard to Xinjiang-related issues, recently some western media, in order to fabricate sensational news, has played a disgraceful role and led to negative effects. They reported Xinjiang in a very irresponsible way either based on hearsay or citing false or fictional sources. We all know that respecting truth is the lifeline of media reports. Recently we have seen many scandals involving the western media in this regard. We hope that the relevant media can observe the professional ethnics of the press. I have to point out that some western politicians and media have made a fundamental mistake on Xinjiang-related issues since they have replaced the concept in a disguised way and defined the efforts China has taken to fight terrorism, uphold stability and eliminate extremism in Xinjiang as the actions specifically targeted at Uygurs or Muslims. Regarding this issue, recently, we have made quite a few clarifications and explanations. Given the recent hyping up by some western media, I think it is necessary for me to stress a few more points. First, opposing linking terrorism with certain nationality or religion is the consistent position of the Chinese government. Second, the Uygur ethnic group is a member of the big family of 56 nationalities in China. According to my information, in the early years after the founding of the People's Republic of China, the population of Uygur ethnic group was only over 3 million, and now it has increased to around 12 million. The vast majority of the Uygur people live in harmony with people of other 55 nationalities and enjoy a happy and contented life. You all know that quite some well-known stars in China are Uygurs. They are active on the artistic stage to carry forward the cultures and arts of the ethnic minority groups in Xinjiang and make these cultures and arts shine brilliantly on stages across China and through the media outlets. Third, as for the people affected by terrorism and extremism, the Xinjiang Uygur Autonomous Region has taken a series of measures, including setting up vocational education and training institutions, to address both the symptoms and root causes. Steps have been taken to help those people learn languages, study laws and acquire skills so as to get rid of the control of religious extremism and return to normal life. This can be compared to the principle of "Jun-Chen-Zuo-Shi" in traditional Chinese medicine prescriptions. Jun-Chen-Zuo-Shi, four kinds of herbs with different effects, can achieve the optimal result of treating the root cause of the illness, enhancing each other's effects and curing the disease and saving the patient after being used together as they can coordinate with each other. Facts have proven that the steps taken to fight terrorism and uphold stability in Xinjiang in the past two years have achieved positive and remarkable results. A couple of years ago, Xinjiang witnessed frequent violent terrorist attacks, but now there has not been a single violent terrorist attack in Xinjiang in the past 24 months and the sense of security of people of all ethnic groups there has been greatly enhanced. Fourth, you mentioned some US media reported that China has stepped up program of surveillance and installed a lot of surveillance facilities in Xinjiang. Installing surveillance facilities is a common practice in countries around the world to maintain security and stability. According to a research report that I once read, as early as in 2010, that was eight years ago, there were 4.2 million surveillance cameras in Britain, accounting for 25% of the world's total and covering the streets, alleys and expressways in almost all cities. There were about 500 thousand surveillance cameras in the downtown of London alone. The New York police also built a city surveillance system, where the surveillance devices targeting pedestrians and vehicles can be found in every corner of New York and the information in personal mobile phones is being tracked and examined. These surveillance cameras or devices are unconscious and unbiased. We cannot say that the use of surveillance devices in Britain, the US and other countries is unbiased, justified and necessary while the use of them in China is biased, discriminatory and unjustified. The surveillance devices themselves cannot discriminate and target certain ethnic group. Instead, they are used to deter bad people and protect good people. Why western countries taking these measures is protecting human rights while China doing the same thing is violating human rights? I think there is only one explanation: double standards are applied here. At last, I also want to point out that the measures taken by Xinjiang Uygur Autonomous Region to fight terrorism, eliminate extremism and safeguard security and stability are useful, effective and positive explorations in terms of taking preventative steps to counter terrorism. We are willing to step up the exchange of experiences with other countries that are beset with terrorism and extremism so as to achieve continuous improvement. 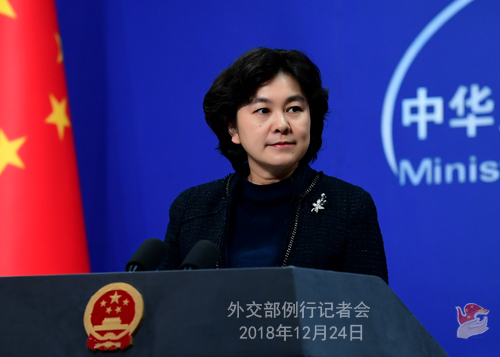 But we firmly oppose that certain countries' officials and media apply double standards on this issue, politicize and stigmatize the efforts and measures China has taken to counter terrorism and eliminate extremism, and viciously attack China's policies on ethnic groups and religion. We once again urge certain western countries' officials and media to abandon ideological biases, view the measures taken by Xinjiang Uygur Autonomous Region to uphold security and stability in an unbiased and objective way and stay committed to showing a real China that is making progress and pursuing opening-up to the world in an all-dimensional, objective and all-round manner.